One of the most useful patterns that we have employed in our iPhone game is the singleton. For those who don’t know, singletons are a class that only gets instantiated once in your application’s run-time. They often take the form of manager or factory classes. A good example of a singleton is the web-based resource manager class that we posted about recently. Below is a template for the singletons that we use in objective-c. Note: A singleton does not need to be explicitly allocated or initialized (the alloc and init methods will be called automatically on first access) but you can still implement the default init method if you want to perform initialization. 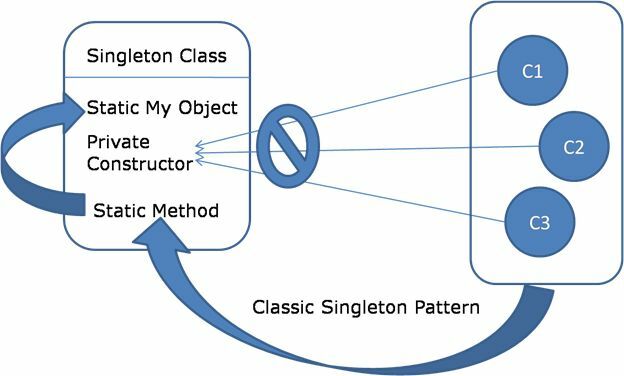 A well-designed singleton is a discrete, self-managing object that manages a specific role within your program. Variables hung off the Application delegate should be limited to objects that relate to the Application delegate in some way. A singleton should be entirely focussed on its own specific role and responsibilities. To avoid the anti-pattern known as "coupling" your singletons should have zero (or practically zero) connections to the rest of your program — they should be stand-alone little pockets of functionality. Search the Mac OS X Reference in XCode for methods that begin with "shared" to see the ways in which Apple use singletons to create "manager" objects which allow you to get, set and manipulate entities that exist only once in a program. Also, since the singleton is accessed through a method, there is some abstraction around the specific implementation — you could move from a true singleton to a per-thread based implementation if you needed, without changing the external interface. How to display current date and time in iPhone? How to convert string uppercase in iPhone? How to create Hello world programe in iPhone?